Qatar Rail officials with the design of Doha Metro and award the company received at the InnoTrans International Trade Fair held in Berlin. Qatar Rail participated in the InnoTrans International Trade Fair held in Berlin, last week. At the expo, Doha Metro Train bagged the “Excellent Product Design” award. Attended by 3,000 exhibitors from across the world, the InnoTrans is considered one of the major transportation trade fairs. The event had nearly 130,000 visitors from 119 countries, according to a statement from Qatar Rail yesterday. The fair was an ideal platform for the young Qatari engineers to exchange their expertise and learn more about the latest technological solutions and innovations in the public transport sector. The visitors enjoyed Qatar Rail booth with Lusail Tram driving simulator experience and the virtual reality tour on board of Doha Metro train and stations. The booth stood out with its traditional Qatari Majlis design and the unique Doha Metro stations arcs. Sheikh Saoud bin Abdulrahman al-Thani, Qatar's ambassador to Germany, visited the booth and commended the team's efforts in representing the country at the international event. On the side-lines of InnoTrans International Trade Fair, Qatar Rail senior management led by its CEO and managing director Abdulla Abdulaziz al-Subaie held a number of high-level meetings to discuss strategic issues with its international partners including delegations from Kinki Sharyo, Thales, the French Keolis and Alstom. Kinki Sharyo's president and members of the board of directors were present at the Qatar Rail pavilion. 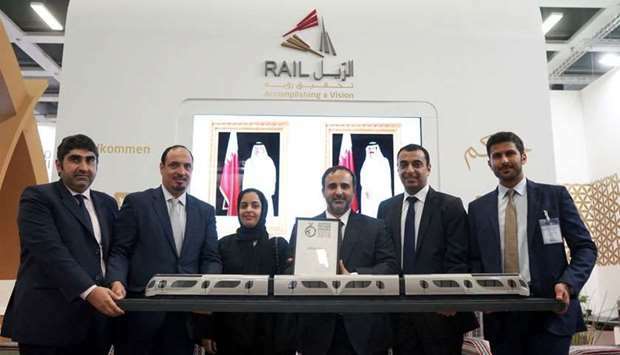 Qatar Rail Metro trains’ fusion of elegant, modern and futuristic design have proven to be an award-winning concept on a global platform when the design was awarded the "Excellent Product Design" under the Transportation category By the "German Design Award". The German Design Award aims to contribute to the overall commercial success. Prizes are only being awarded to projects that truly represent pioneering contributions to the international design landscape. A company can only enter the competition for the "Design Award" if its product has already been awarded a national or international design prize. Doha Metro Train had won the coveted International Red Dot Award and the iF International Forum Design and hence qualified for the nomination. The designs of the Doha Metro trains which recently received the German Design Council Award are an embodiment of Qatari heritage and culture combined with state-of-the-art technology.